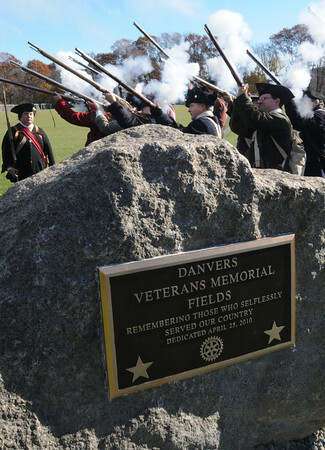 The Danvers Alarm List Company fires a salute near the conclusion of the Danvers Veterans Council dedication of the memorial at the Veterans Memorial fields at the Thorpe School. The new memorial is in the foreground. Photo by Ken Yuszkus / The Salem News, Monday, November 11, 2013.